Mark and Linda Cagley pose for a photo with their daughter, Lauren. Lauren Cagley had multiple universities and scholarships from which to choose—including a Park Scholarship from NC State. Excited by the many opportunities available to Park Scholars—from retreats to weekly meetings, faculty mentorship, learning labs and service projects—she accepted the scholarship and enrolled at NC State. Today, Lauren is settling into the next phase of her life as an employee of ExxonMobil Research & Engineering outside Washington, D.C., and Lauren’s parents, Linda and Mark, are confident that her time as a Park Scholar has equipped her for her career and also provided her with valuable life experiences. 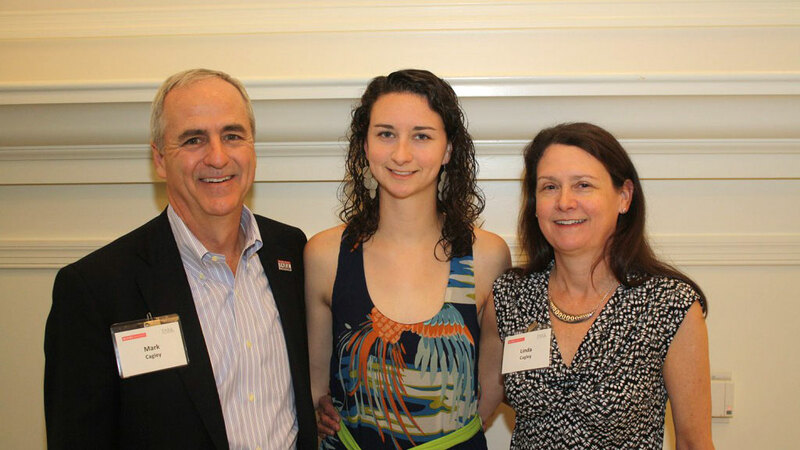 While watching their daughter grow and thrive at NC State, the Cagleys began giving annually to support the university. Shortly before Lauren’s graduation, Linda and Mark decided to establish the Cagley Family Endowment to support future Park Scholars for generations to come. “We believe that we have a responsibility to give back,” Linda said. And for the Cagleys, that means the whole family. When Mark and Linda came to campus to sign the agreement establishing their endowment, Lauren was there signing the agreement with them. “Creating the endowment was a family decision. As a Park Scholar, Lauren was the recipient of great generosity in addition to great opportunity. As we thought about the wonderful gift that the Park Program has given our family and considered what we had saved for college, we began our giving in support of the Park Scholarship Program. And, we are encouraging Lauren to do the same,” Linda said. She’s also encouraging her fellow Park Scholar parents. Despite no longer having to participate in the rituals of back-to-school, Linda visited campus to share a few thoughts, and perhaps a little reassurance, with the parents of the newest class of Park Scholar freshmen. As a Park Scholar, Lauren took advantage of the many opportunities available to her at NC State. She participated in research to support medicine, stem cell biology and tissue engineering. She helped coordinate the Krispy Kreme Challenge, which in her senior year raised more than $170,000 to support the North Carolina Children’s Hospital. She had two summer internships, studied abroad in Prague, was a member of a sorority, and found time to squeeze in a rock climbing class, all while pursuing her degree in Chemical and Biomolecular Engineering with minors in Biotechnology and Genetics. “I would say that she experienced tremendous personal growth while at State largely due to the Park Program. Mark and I believe strongly in parents supporting the Park Scholarship program and the university. For the Park Program to continue to grow and attract exceptional students, financial support from the extended Park family – alumni and parents – is needed. To the extent that we are able, I believe we have an obligation to support the program and these students,” she said.